As a musician it's good to busy at your craft. And Arjen Lucassen is always busy; actually, he probably has trouble slowing down from his prolific compositional pace. 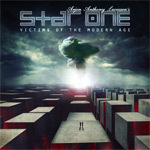 Lucassen returns with the second studio album for his Star One project Victims of the Modern Age, following 2002's Space Metal. The breadth and depth of ambitious arrangements abound as well. However, there is less of the ethereal space metal, and more of a larger, heavier, and more bombastic flavor of metal. The guitars are thicker and solos abound, but Broek's keyboard solos are equally abundant and engaging. Again, as with the previous work, Victims of the Modern Age is a concept album. Yet, this one is set on earth rather than space. The songs are based on dystopian and post-apocalyptic sci-fi movies. Typical of Lucassen, he wouldn't divulge which films inspired, leaving it for our speculation. Fundamentally, then, Victims of the Modern Age is pure Arjen Lucassen, and one of his finest works to date. With the heavier edge under girding versatile and entertaining arrangements, songs like Digital Rain, Cassandra Complex, and the excellent title track Victims of the Modern Age are Lucassen masterpieces. A song like 24 Hours adds the element of near opera-like drama in the lyrical content and vocal arrangements. Then the Star One company delivers the grand and bombastic melodic prog metal that intrigues, overwhelms, but most importantly entertains. Victims of the Modern Age is everything one would want, and much more. Clearly, with the second installment of Star One, Victims of the Modern Age, Arjen Lucassen and his talented crew have created an terrific and entertaining work, excelling beyond their past achievement. Strongly recommended. Clearly, with the second installment of Star One, Victims of the Modern Age, Arjen Lucassen and his talented crew have created an terrific and entertaining work, excelling beyond their past achievement.